STAR TREK At 50: The Animated Series - More Tribbles, More Troubles | Warped Factor - Words in the Key of Geek. Produced by Filmation and Paramount Television, The Animated Adventures of Gene Roddenberry's Star Trek (as it was heralded by BBC1 back then) was my first introduction to the world of Star Trek back when I couldn't have been more than 5 or 6. In fact, I clearly remember being quite shocked to discover there was an actual real version of the cartoon on TV one night, a good year or two after loving this cartoon series. Not that I knew them at the time but all the Original Series actors voiced their respective characters (except for Walter Koenig), however, as is common in animation, none of them actually sat down together to do the recording, so there's a bit of disconnect in delivery. But which 5 year old worries about that? I guess most Trekkies have a soft spot for the tribbles, even those that love to hate the little balls of fluff. They are just so iconic and The Trouble With Tribbles is one of those episodes that even non-fans could likely name. So it really made sense that Filmation should resurrect the tribbles for a sequel. On stardate 5392.4, while the Federation starship USS Enterprise escorts two robot cargo ships carrying quintotriticale, a new seed grain, to famine-stricken Sherman's Planet, it encounters a Klingon battlecruiser pursuing a Federation scout ship. When the Enterprise rescues the pilot, the Klingons attack with a new energy weapon capable of incapacitating a starship and demand that the pilot be handed over to them. The pilot turns out to be Cyrano Jones, an intergalactic trader well known to Captain Kirk and crew. The Klingons desperately want Jones for introducing the tribble to Klingon planets where it has become a major pest, and for stealing a glommer, an animal the Klingons created via genetic engineering to prey on tribbles. Jones had stolen the only glommer prototype in existence. Kirk expresses sympathy for the Klingons' plight but reluctantly refuses to hand over Jones as he is a Federation citizen and entitled to the Enterprise's protection. Jones is now selling "safe" tribbles genetically engineered to omit their ordinarily unrestrained multiplicative proclivities. Chief Medical Officer Dr. McCoy discovers that although Jones' "new" tribbles don't reproduce, they still have ravenous appetites. Instead of reproducing, they now grow hugely fat. 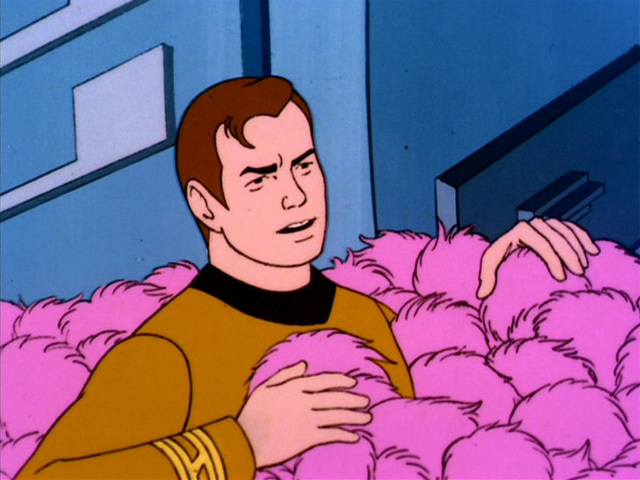 McCoy also discovers that the new large tribbles actually house many more tribbles inside of them! What a great concept! And what happens next is great fun, resulting in the Klingon's shooting a large tribble, only to inadvertently free the smaller ones inside! The site of Klingons up to their chest in tribbles is marvellous. 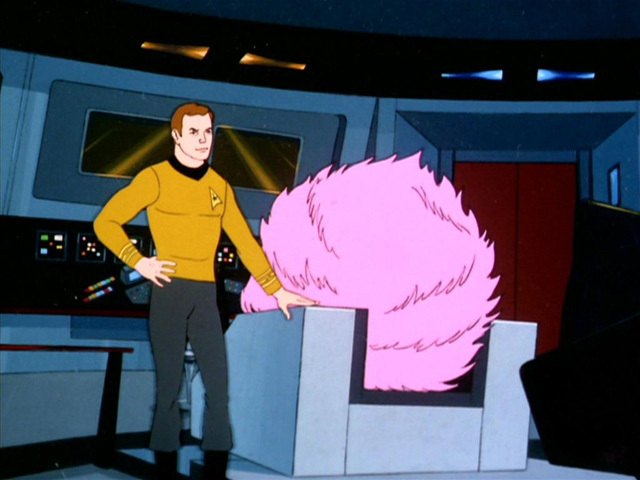 You know, you can argue about the limited animation and the cost cutting techniques, but all I know is that, like many of the other episodes in The Animated Series, More Tribbles, More Troubles is great fun. It's a brilliant way to introduce kids to the world of Trek, and was clearly produced with much love and respect for the Original Series. 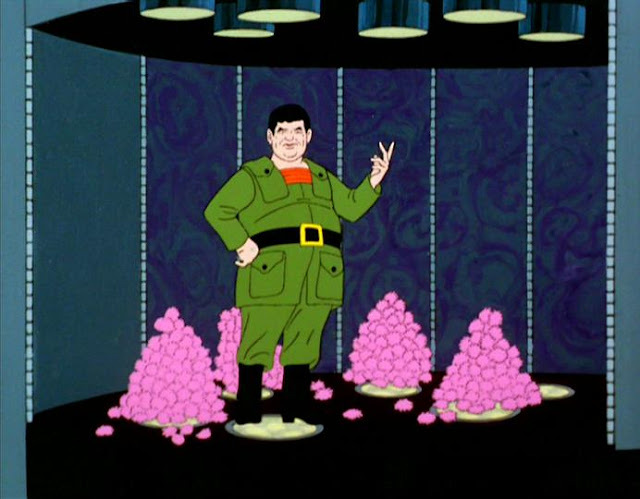 David Gerrold, the writer of The Trouble With Tribbles, was commissioned to script this animated sequel, and they even bought back Stanley Adams to reprise his role of trader Cyrano Jones. I loved Star Trek: The Animated Series as a kid, and I still love it today. And More Tribbles, More Troubles is easily my favourite of all 22 episodes.